Damage restoration services are necessary after any disaster to restore your home and your life. 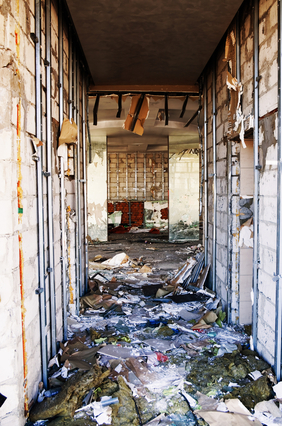 Damage Restoration Services are required after a natural or man-made disaster. Damage restoration services are required after a natural or man-made disaster. These services are designed to get your life back to normal as soon as possible and to mitigate ongoing damage to your property. It is important that your damage restoration services contractor be able to provide service quickly and efficiently within the confines of your insurance policy so that out-of-pocket losses are minimized. For example with water loss if the water is allowed to stand and items remain wet we have the added issue of mold developing which greatly increases the size and scope i.e. money required to restore the property. So fast response is of primary concern. Of course having the right equipment to provide the damage restoration services is paramount as well. Without the proper equipment the job will take longer than necessary and typically the most expensive part of a restoration project is the manpower required to bring the property back to previous condition. In addition the know-how and expertise of the company management, supervisory staff, and laborers is all very important as well. You want your home or business going together as it was or better than it was. Having poorly trained staff to make the matter a lot worse than it needs to be. Having a loss that requires a damage restoration service is a very stressful situation for a home or business owner. There is a certain amount of finesse and sensitivity training that is required of all employees and management dealing with the client. A situation like this can be very overwhelming and if you’re dealing with a company that does not care it can add a lot of stress to an already stressful situation. With Systematic we have been trained under IICRC guidelines, have some of the most modern and state-of-the-art equipment available to the restoration contractor, and only hire people that are caring and kind (and of course background checked). We are family-run organization and we treat our clients like they are an extended part of that family. So if you need damage restoration services consider Systematic. We operate 24 hours per day seven days per week, can handle almost any damage restoration project, are fully certified under IICRC, are fully insured, and care about you in your time of need. We like to save that “we restore people, properties and reputations” but what we really do is restore your life. We take pride in the work that we do and we do it honestly and ethically. So if you have need for a water restoration, fire restoration, storm damage restoration, mold remediation or HVAC or carpet cleaning give us a call. Speak to one of our representatives, have one of our technical specialists come out and give you a free price quote. We can’t take all the stress away but we can certainly do our best to make a bad situation better. Good service is a commodity nowadays and we are happy to say that is a commodity that our company is abundant in.